In 1987, before film photography was steamrolled by digital photography, 60% of Rochester’s work force was employed by Kodak, Bausch and Lomb and Xerox. Twenty five years – a generation - later, that proportion had fallen to 6%, even as the population had dropped by 100,000 over fifty years. In the recent years preceding Eastman Kodak’s 2012 bankruptcy filing, photographers saw the gradual withdrawal of longstanding Kodak products. The company’s announcement that it would cease production of its flagship positive film Kodachrome seemed to punctuate the transition from film to digital with finality. 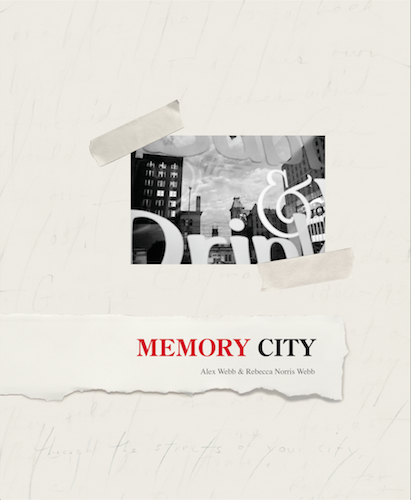 Alex and Rebecca Norris Webb’s Memory City presents itself as an elegy for Rochester, Kodak’s company town, and also for film photography as it is overwhelmingly replaced by digital photography. The book is an album of color and black and white photographs, hand-written notes, several tipped in photographs, a timeline of Rochester, and a booklet, “Notes on Film and Memory”. The title is borrowed from Italo Calvino’s Invisible Cities, in which Calvino presents an imagined conversation between Marco Polo and Genghis Khan about cities that Polo has visited; some of these are “memory cities”, though we eventually learn that all of Polo’s accounts are filtered through his memory of his own home, Venice. Memory City cannot be read simply as an act of tribute to Rochester, Kodak and film: these homages exist in the book as elements of a much more expansive exploration of photography, generally. Memory City ably links major tropes from photography’s history with the specificity of the Webbs’ explorations of Rochester. The book addresses the experience of making pictures, and of interpreting them, and is exhilarating in its presentation of images that have as much to say about the photographers as they do about the subject. The people in Alex and Rebecca Norris Webb’s Rochester are surrounded by dissolving images. Memory City is nostalgic and melancholy, a portrait of uncertainty, fading dreams and memories assembled for a final review. Eyes are almost uniformly turned away from the camera or hidden under hats and hoods and expressions are largely unreadable, even as the figures in the posters and murals that also populate these photographs smile or look forward optimistically from the past. The only human subjects who we see looking outwards are seen through windows or in reflections. Along with images of images, the book is also full of windows and mirrors. Windows and mirrors presented the earliest analogues for understanding photography, as early innovators attempted to find a language for describing photography’s relationship to vision. Oliver Wendell Holmes called the daguerreotype “a mirror with a memory”, and windows and mirrors have been deployed repeatedly, both practically and metaphorically, over nearly two hundred years. In the Webbs’ photographs, many of the surfaces act as both windows and mirrors. The window forms a flat surface framing the subject, a picture space within a picture, even as the reflected world is superimposed on the subject’s face. The subject’s gaze creates a mirror relationship between viewer and subject, and we see the capacity for photographs to create empathy; when we see another’s eyes clearly, we can imagine ourselves knowing them, perhaps even being them. In one instance, twin girls dressed differently appear as mirror images of one another, mediated by a reflective surface. It’s an evocative effect, and the Webbs certainly aren’t the first to use it, but what the Webbs do is to present this reflecting and mirroring itself as the subject, using it repeatedly, knowingly; the device is positioned as a trope through repetition. The power of the individual image is, however, not reduced. Amanda with Her Flower Girl Dress by Rebecca Norris Webb is startlingly beautiful; Amanda’s naked eye, revealed through a hole in the window, feels defiant of romanticization, cutting through both memory and nostalgia. Following the theme of memory, there are many images of dresses photographed by Rebecca Norris Webb, a quinciñera dress, a prom dress, a wedding dress. They are photographed hanging on hooks, sometimes in plastic; they appear gauzy and distant, objects saved and preserved to commemorate occasions of youth and promise. The dresses are photographed insistently; two of the contact sheets are tipped in to the book, and others are included in the booklet: we see the record of an entire roll of negative film made of the dress with approximately the same framing. And just as we feel how one photographer is positioned in the moment of making pictures, we also come to understand how another is positioned in relation to his long career. Alex Webb is known for his work in Haiti, Cuba, the Amazon, the U.S.- Mexican border, the “hot light and half made worlds” that he recorded on Kodachrome’s brightly saturated palette. When he began shooting in Rochester in 2012, Kodachrome could only be cross processed as black and white film, and so the black and white images in Memory City were shot on Kodachrome, but printed in a grainy, somewhat distressed monochrome. Webb’s personal history is inscribed in the form of the pictures that he can no longer take with Kodachrome; he takes those color pictures digitally instead and uses Kodachrome to make pictures that evoke nostalgia for an earlier time. The juxtaposition of color digital and black and white film images measure the distance between his current and past practices; like Calvino’s Marco Polo, the storyteller cannot but filter the story of the subject through her or his own experiences. Rochester’s challenges cannot be reduced to the supplanting of film by digital photography. The trials of Rochester are those shared by many other cities in post-industrial America as they struggle to redefine themselves. Kodak emerged from bankruptcy in 2013, reorganized and having sold off a large part of its business, and Rochester, despite the elegiac tone of the book, survives and changes, diversified and rescaled like so many other rust belt cities. But if Memory City is not a rigorous sociological study of Rochester, it is a powerful analysis of the use of photography and the ways in which memory and history are served by images, and as such it’s one of the best photography books about photography that I have seen. Memory City is about the material life of images, and the relationship between memory and material; and it examines how our acts of looking at ourselves fold us into the world of images that surround us. It also imaginatively describes the relationship between the photographer and the act of photography, reminding us that the photograph is not only evidence that the subject was there, but that the photographer was there too. This recognition of embodied looking is something frequently addressed in prose but rarely so effectively with photography.